There is no doubt that Rodel Mayol has the ability to upset Ivan Calderon in their coming fight on June 13 (June 14 in Manila) but ability is just one of the necessary attributes, capability is another. 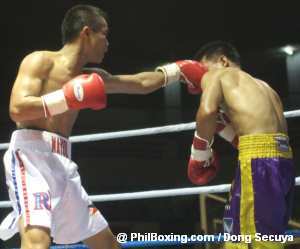 From the past performances of the Mandaue native, you could only wonder if the Cebuano pug has the capability to line himself alongside Ivan Calderon as among the best little men in boxing nowadays. Mayol seemed never able to learn from his bitter lost to Eagle Kyowa, that from his succeeding fights against Ulises Solis and Adrian Hernandez, we saw the same old stubborn Mayol. Indeed Mayol won his next two outings last year against fellow Asian fighters, but he has to prove that his real worth does not only belong in the OPBF level. Mayol for me in comparison to Pacquiao in their early days is more talented, but Mayol seemed not to have that real warrior-heart Pacquiao possesses and the attitude to succeed. And so lies the question, Mayol has the ability, meaning he has the skills, but does he has the capability? Meaning is he capable to discipline himself and push himself to the limits of his athleticism? I accepted the reason of managerial woes when he fell short of winning over Eagle Kyowa in 2004, but successive losses to Solis and Hernandez would make you think whether Mayol really had such acceptable excuses in losing his important fights. Tracking-back, against the Japanese-managed Thai fighter Kyowa, Mayol would have won the fight if only he had enough stamina to last the 12 full rounds. Most observers believed it was a case of wrong strategy that caused him losing steam and eventually losing the fight. However, the succeeding losses to Solis and Hernandez would make us question Mayol’s dedication in preparing for a fight. Mayol’s loss to Solis was somewhat similar to that with Kyowa, Mayol could have floored Solis to end the fight but his limited stamina prevented him in doing it and was kayoed in the process. In the Hernandez fight, he claimed to have been a victim of a set-up saying that Hernandez turned out to be a world-class opponent and not the usual journeyman boxer he had expected. But come on Mayol! Whether setup or not, you are more experienced and highly regarded than Hernandez! In other words, Mayol was indeed never expected to lose in such lousy fashion. The fact is Adrian Hernandez neither had any elite victims nor experience fighting a world-class boxer in his resume upon fighting Mayol. To further dismiss Mayol’s lame excuse, the Mexican Hernandez after his victory on Mayol could only register a draw against the aging Eric Ortiz and in his next outing was kayoed flat by journeyman fighter Oscar Ibarra. Interviewed recently by Dennis Principe on the radio program Sports Chat over DZSR, Mayol said he is taking this fight with Calderon as a make or break fight. I hope this time around Mayol is true to his word and is really treating this fight as a make or break fight and would give his real best not only on the actual fight but also more importantly in the gym going into a date with Calderon in the ring. Mayol frustrated us boxing fans believing that he has what it takes to become a world champion, I hope he already blamed himself of his current failures and realized the frustrations he gave to his fellow countrymen. Manny Pacquiao suffered the same managerial woes going into his first fight with Erik Morales. The Pacman lost the fight with Morales but we saw how Manny made the fight so competitive against Morales despite of the trauma he had with Rod Nazario and Murad Muhammad. This coming fight with Calderon is a real big task, I could imagine only a few, especially the experts, would only give Mayol a very slim chance of winning over the very elusive and intelligent Ivan Calderon. From the eyes of many, the Puerto Rican is a mile of a favorite over our boy Mayol that even the respected Hugo Cazares who obviously had far proven himself than Mayol failed to topple the current best little man in boxing. Coming out of a frustrating career in facing a seemingly invincible Calderon, the parameter for Rodel Mayol is simply go out there and show the boxing world that he belong to the league of Calderon. This writer does not necessarily counting out Mayol in his coming fight with Calderon, but if he has to lose, at least show the Filipinos that he belong up there with Calderon as among the little big men in boxing. No more excuses Rodel please!!! I wont judge you in case you would lose to Calderon but rather would judge you according to how you performed. Even the great Manny Pacquiao when he welcomed Mayol into his fold last year sarcastically said that Mayol could be a world champion if only he could be serious in his boxing career. To you Rodel, no one is doubting your ability but what we doubt is your capability for dedication and heart to succeed in the sport that you choose to provide comfort to your family. You have to learn that before climbing the ring, most of the fights are already won in the gym. You prepare for the worse and one of it is to stay competitive up to the last round of a championship fight. Ability covers the skill aspect of the fight game but capability covers the heart, dedication and attitude, which are all equally important to be a world champion. Mayol has the ability but if he is lacking in capability it will only be a miracle for him to become a world champion. Take this as a challenge Rodel!